THE Halifax-Huddersfield side are Yorkshire Inter-District League junior champions for the first time ever. Frank Greaves’s players completed a clean sweep of their fixtures with a 22-14 success away to Harrogate at Ripon City Golf Club on Sunday. It was their seventh successive win in 2018 and their aim now will be to complete a double in the Six Man Team Championship at Headingley on August 30. The junior league was launched in 2003 and Halifax-Huddersfield have had a very modest record in it until this summer. The visitors had a slight edge on handicaps at Ripon but that was probably negated by home advantage and it was 6-6 after the morning foursomes. 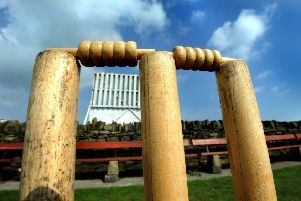 However, Halifax-Huddersfield won eight of the 12 singles contests to put the title race to bed at an early stage. A 2&1 win for Crosland Heath’s George Hanson in the ninth singles contest on the card sealed the title success. Dates for the fixtures are arranged between the district Unions and some teams are only half-way through their programmes. Greaves runs the local Union’s senior side and has also taken the reins of the juniors this year, making a big impact. He said he had been “proud and emotional” when the title was sealed and praised his players. Edwards, the lowest handicap player on the team, is a former Crow Nest Park junior captain now playing out of Huddersfield Golf Club. The pair will be playing for Yorkshire Boys against Lancashire on Monday while another Crow Nest player, Loiue Walsh, plays in an under 16s Roses clash on Thursday. Halifax-Huddersfield got their campaign off to a flying start in May with successive home wins over Teesside (26-10), Sheffield (26-10) and York (27-9). They crushed Bradford 31-5 at East Bierley on June 1 and started July with a 19-17 win over Leeds at Crosland Heath before going back on the road to beat East Riding and then Harrogate by the same eight-point margins. Sunday’s scores (Harrogate names first) - foursomes: A Harm & R Fawcett lost to J Edwards & H Mowl 1 down, O Abbott & H Mountford lost to I Turner & L Eccles 1 down, G Stevens & C Littlewood bt L Walsh & B Walker 3&2, W Edson & M Wharldall bt D Shaw-Radford & G Hanson 2 up, R Clark & G Hall lost to T Pearson & A Motala 8&7, E Forbes & J Wilcox bt M Nicholson & N Crane 3&1. Singles: Harm lost to Edwards 3&1, Fawcett bt Turner 4&3, Abbott lost to Mowl 4&3, Stevens lost to Eccles 2 down, Wharldall bt Walker 5&3, Edson lost to Shaw-Radford 3&1, Littlewood lost to Walsh 1 down, Mountford bt Pearson 4&2, Clark lost to Hanson 2&1, Hall lost to Nicholson 2 down, Forbes lost to Motala 3&1, Wilcox bt Crane 4&3.